The above pictures represent about a quarter of the figures included in this set, which has no less than 123 different poses along with 30 horses. 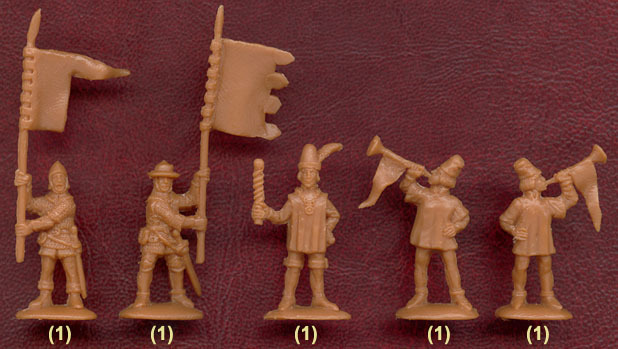 The bulk of this set is made up of all the figures already released in the Strelets sets of Army of Henry V, The Scottish Army of Wallace and English Cavalry of Edward I, so to avoid repeating all the pictures and comments on those sets we would refer you to the links for the relevant reviews. Looking solely at the figures that are new in this set, those pictured above, we find a real mixed bag. The first row holds a collection of flag-bearers and heralds, while there is quite a party going on in the second. Various knights fill the third while the fourth has a knight bringing in a wounded comrade for the doctor and attendants to look after. Row five begins with a man who has a very nasty wound - some sort of spear through the chest - while the rest are prisoners and an executioner. Below them there is a nice little scene of a man being knighted and next to that there is a cook with his pot, plus a target for archery practice. More knights on foot and mounted, including a king in row seven and a bishop in row eight, complete the very diverse contents of this large box. 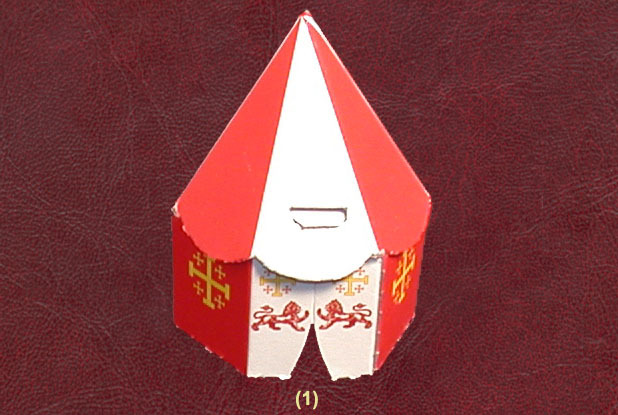 However there is one more component, the cardboard tent, which is actually printed on the box itself. These new figures are meant to build on the many medieval sets already available, so the archery target can be placed next to a group of archers, and the doctors can be tending some of the casualties from various sources. The partying figures are a lot of fun and have plenty of life, while the jester and musician would work well in a royal court scene. Since none of the horses seem to be moving very much they work well for close-quarter combat scenes, and when paired with the mounted figures in this set they make good command figures, while the heralds would have a role to play both in battle and at court, perhaps at a tournament. The sculpting on these is very nice, with good textures on the mail and some really good facial expressions on some of the character figures. Some of the mounted men are noticeably taller than those on foot, and some do not fit into the saddles on the horses. However overall they are noticeably better then the older figures with which they share a box. Good proportions and not a trace of flash help too, and if these are not up with the most elegant figures on the market, then they are certainly good enough to be placed next to them without obvious compatibility problems. Many will complain at the need to buy such a large set with so many old figures simply to gain the new ones, and we can see the strength of that argument. However while the older figures are nothing special the new ones are both imaginative and better produced, and will certainly be tempting for those with an interest in all things medieval.